LOUISVILLE, Ky. (AP) — American whiskey producers are suffering a worsening hangover from the Trump administration's trade disputes. 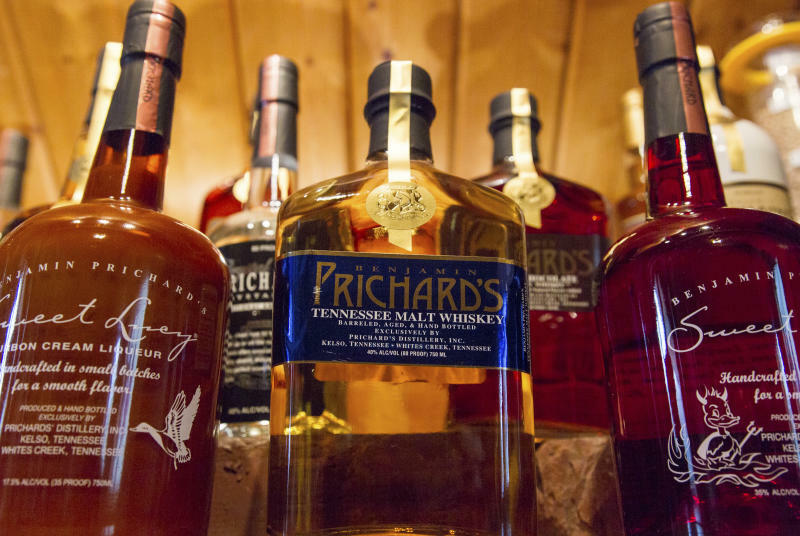 Overall exports of bourbon, Tennessee whiskey and rye whiskey fell 11 percent during the second half of 2018 compared to the prior-year period, as the impact of tariffs started to be felt, the Distilled Spirits Council said in a report Thursday. The drop off was even larger in the European Union, the industry's biggest export market. Last month, the council said total American whiskey exports declined by 8.2 percent between July and November of 2018, but that report did not include December numbers. American whiskey makers have been caught in the middle since mid-2018, when the EU targeted American whiskey and other U.S. products in response to President Donald Trump's decision to slap tariffs on European steel and aluminum. Whiskey makers in the U.S. also face retaliatory tariffs in Canada, Mexico, China and Turkey as part of other trade disputes. Those duties amount to a tax, which producers can either absorb in reduced profits, or pass along to customers through higher prices — and risk losing market share in highly competitive markets. The EU still accounted for nearly 60 percent of total American whiskey exports in 2018. The United Kingdom, Spain, Germany and France are among top export destinations for American spirits. And the end-of-the-year holiday season is traditionally the spirits industry's strongest sales season. Large and small American distillers alike are sharing the pain. 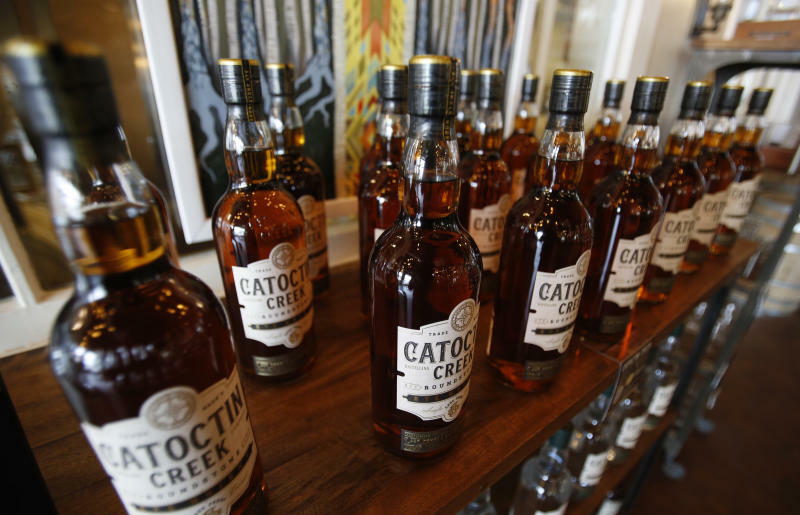 Scott Harris, co-founder and general manager of Catoctin Creek Distillery in Virginia, said Thursday that just 1 percent of its overall 2018 revenues came from Europe, compared with about 11 percent the prior year. Before the trade disputes erupted, he had hoped the European business would grow to one-fourth of total 2018 revenues. "Essentially, it just turned off, went off a cliff," he said of his distillery's business in Europe. It's created a dilemma for Harris — whether to resupply his rye whiskey stocks in Europe to maintain a presence there in hopes the trade conflict ends soon. "Are we going to take it on the chin and just eat the cost of the tariffs ourselves by lowering our price into Europe just to stay relevant in the market?" he said. "Or are we going to not sell over there?" He hasn't decided yet. His distillery's domestic sales rose 30 percent last year, but as his sales evaporate in Europe, he sees a "lost opportunity" after working for years to develop markets there. American whiskey exports to the EU surged by 33 percent in the first half of 2018, partly due to stockpiling of whiskey supplies by some large American distillers ahead of the tariffs. Smaller distillers, however, didn't have the luxury of stockpiling. And with those supplies disappearing while trade disputes continue, large distillers are being hit, too. Spirits industry giant Brown-Forman Corp., best known for its Jack Daniel's Tennessee Whiskey brand, said recently that if the tariffs stay in place, the annualized cost to the Louisville, Kentucky-based company would be about $125 million. The company said it is taking actions to try to mitigate about half of the tariff impact expected in its current fiscal year.